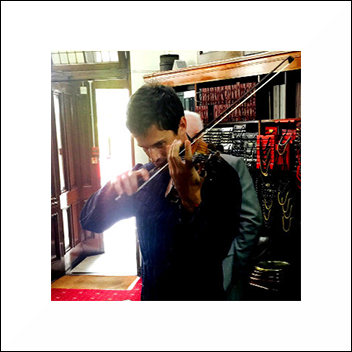 English contemporary classical violinist, model and Meyer & Mortimer customer, Charlie Siem, stopped by the shop this week for a first fitting for his classic chauffeur's jacket. Charlie is a long-standing and valued customer of Meyer & Mortimer after finding one of his father’s military jackets which he wore (a la Hendrix) out and about. He loved it so much he and his brother checked the label on the garment and tracked us down. That was over ten years ago and since then Charlie has collaborated with Head Cutter & Director, Paul Munday, and have made a range of formal and casual wear always keeping in mind his profession and the need for his clothes to move freely. This week Charlie came in for a first fitting for his jacket and brought, of course, his violin with him. Paul Munday, had cut a large box pleat in the back of the jacket to allow for that extra movement so Charlie wanted to ensure it did not impede his playing. He did this by giving the shop a wonderful performance (with a snippet shown here caught on film) that literally downed needle, chalk and shears of those working around him. Thank you to Charlie for allowing us to share this with you. Charlie’s album, Under The Stars, is currently available to buy from his official website or from your favourite online music store. Follow Charlie Siem on Twitter and Instagram.